People do their best to resist marketing efforts. People skip commercials, block ads, and trash flyers. Resistance to marketing is often said to be a problem of trust. Getting out and honestly connecting with your potential customers is the answer! Here are 10 opportunities to move your brand into hearts and lives. Your pop-up tents have room for important and eye-catching messages. Make sure people can find what they need in a sea of identical generic tents. A bold “first aid” or “water” tent may be just the thing! Use your tent canopy for a shady spot for people to gather and meet. Community events can be crowded. Don’t miss a chance to meet new potential clients! A sturdy and practical pop-up tent shelters your merchandise and calls attention to your goods at the same time. A twofer! If you are lucky enough to live where sports viewing is a way of life, you know about the pre-and post-game ritual fellowship that comes with tailgating. Tie your brand in with the fun! Anywhere there is a crowd, your pop-up canopy offers a chance to attract people. Use the top, sides, inside and outer surfaces to get your message delivered. Use your pop-up tent and side rails to demarcate your space. A custom pop-up tent allows you to showcase your brand without wasting an inch of space. Showcase your brand connection by loaning your tent to causes that connect with your customers. For example, use your pop-up canopy at a local pet adoption fair or school carnival. Be right in the heart of the action with your brand. Don’t forget small events, too! Let your brand show up at school for some fast connections. 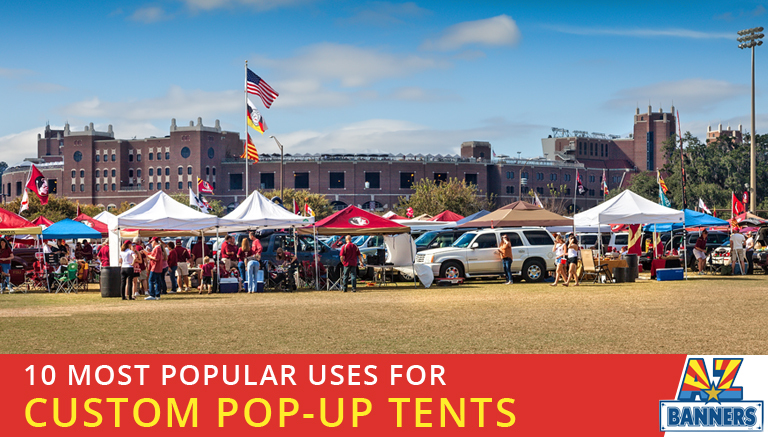 Use your custom pop-up tents to define sales spaces, call attention to your products and more. Custom pop-up tents give you bold branding power wherever you take them. Go directly to your customer and capture their notice. Our experts can help you craft a look that is direct, concise and compelling. Contact us today! If you are considering using a custom pop-up tent to help promote your business, we’ve got you covered! As a top custom shade tent printing company in Arizona, AZ Banners can provide you with an affordable, high-quality pop-up tent for your next event. Request a no-obligation quote or call us at 480-458-8128 today! Our products ship fast, anywhere in the U.S.!